The University of Maryland student activist group I am currently campaign director of is called UMD for Clean Energy. In the past year we’ve worked on getting thousands of Powervote pledges, collaborated with state environmental groups to pass a state global warming bill with the strongest short term greenhouse emissions target in the country, and our most recent accomplishments were organizing(with other groups) a 300 person clean energy Town Hall meeting for House Majority Leader Steny Hoyer(whose floor debate remarks are incredible), and bringing together students statewide to help turn Maryland Congressman Frank Kratovil’s swing vote on ACES into a yes vote. Our close proximity to DC gives us plenty of opportunities to lobby and have a strong presence on Federal legislation. This past Tuesday, we delivered a letter to our Senator Ben Cardin’s office in a visit a couple of our members made to DC to meet with Cardin’s office as well as Senator Barbara Mikulski’s. The letter outlined what our group feels should be prioritized regarding improvements in the drafting of Senate legislation over the House climate bill . Although we know we have Ben Cardin’s vote, he is playing a important role on the Environment and Public Works Committee in drafting the Senate bill, and in marking it up. We would like to see the part of the bill that comes out of the EPW committee be as strong as possible, and feel that there can be improvements since the make up of the committee is fairly progressive and full of East and West coast Democrats who states are not particularly coal dependent. Letter is below, and was signed by our elected officers. 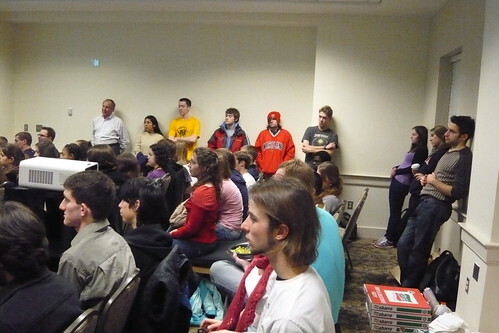 Our student group UMD for Clean Energy has met with you and your office multiple times. Every time we have discussed climate legislation and clean energy, we’ve been impressed with your commitment to a strong climate bill. As you know, in June the House passed the American Clean Energy and Security Act, and now it is up for the Senate to act. Although the bill does some good things and we supported its passage in the House, there are several areas that we feel can be improved. Your position on the Environment and Public Works Committee in drafting the Senate bill is an opportunity to get stronger legislation onto the Senate floor. There are four main priorities we urge you to advocate for in the committee and in the floor debate. The short term emissions target of a 17% reduction below 2005 levels by 2020 is the weakest part of the bill. The science tells us that 25-40% below 1990 levels is needed to avert catastrophic climate change. Additionally, a 17% target makes agreeing on a global treaty in Copenhagen quite difficult, and getting a strong treaty all but impossible. The 2020 target must move in the direction of the science to make America a leader so that we have the leverage we need to pressure other countries to do more. Before compromises were made, the House legislation had a 25% Renewable Electricity Standard(RES), and a 15% energy efficiency standard. This was watered down to a 20% RES. We know there is a much greater potential in renewable sources to meet our energy supply, especially regarding efficiency improvements. Please push for a more ambitious RES that matches our capability and ingenuity. Another compromise reached in the House was that the USDA was made responsible for overseeing domestic agricultural offsets, instead of the EPA. Unfortunately, the USDA may care more about rewarding farmers than reducing greenhouse emissions. By not having the EPA overseeing this part of the program, the integrity and verifiability of these offsets is threatened, along with some emissions reductions. Pushing for EPA authority over agricultural offsets would avoid this potential flaw. Lastly, excluding investments in “clean coal” technology, the House bill commits around $10 billion a year to clean energy development and deployment. This pales in comparison to the investment from the economic stimulus. Although we recognize the bill will drive private sector investment, other countries such as China are spending much larger amounts by comparison. Increasing clean energy spending in the bill is imperative for accelerating our transition to a clean energy economy. Thank you for taking the time to consider our recommendations for passing a stronger climate bill out of the Senate. We truly appreciate your continued leadership on this issue.